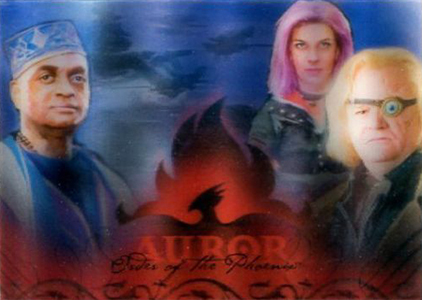 When the 2007 Artbox Harry Potter and the Order of the Phoenix trading cards came out, the card maker had hit its stride with the license. 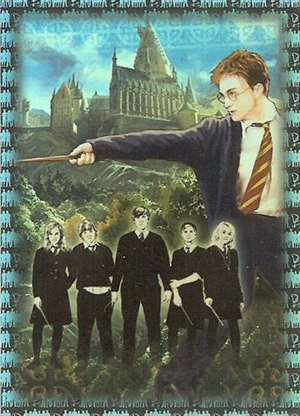 The fifth film in the franchise, it's highlighted by a new mix of autographs and memorabilia cards. Once again, the base set has 90 cards that recap some of the key parts of the film. However, some of the special effects and surprises were withheld as the set came out in time for the movie's theatrical run. Completists will want to know that there are two versions of the set, hobby and retail. The only real difference for the cards is that the hobby version has foil on the base card fronts. The autographs checklist is one of the best Artbox produced, although there are a lot of redemptions. 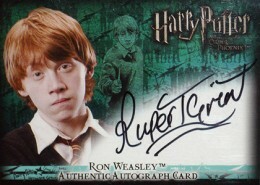 Daniel Radcliffe, Emma Watson and Rupert Grint all signed for the set. Others include Jason Isaacs, Michael Gambon and Evanna Lynch. All but three of the 13 autographs in the product are redemptions and Artbox no longer honors them so be careful when buying packs and boxes now. Autographs combine to fall 1:48 hobby packs. 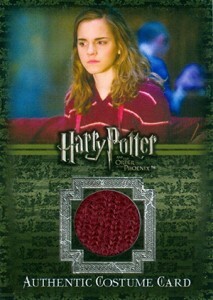 The 18 Costume Cards (1:24 packs) are a mix of outfits worn in the film and material used to make costumes. All are numbered but to different amounts. Material from Gryffindor robes are the most plentiful at 720 copies. The rarest is a tie worn by Katie Leung (Cho Chang), which is numbered to 160. 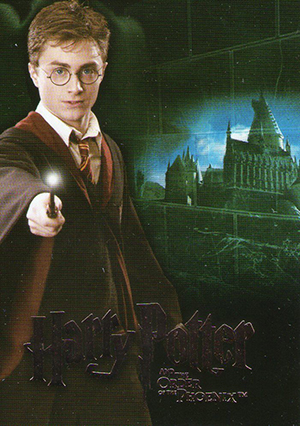 Prop Cards (1:80 packs) include a variety of items used during filming. They include three different Death Eater masks (each numbered to 100), a Ministry Munchies bag and pages from the Daily Prophet. Cinema Film Cel Cards (1:80 packs) come with actual cels from a print of the movie. The set has nine different cards, each numbered to 294. Hobby packs have nine Foil Puzzle cards. 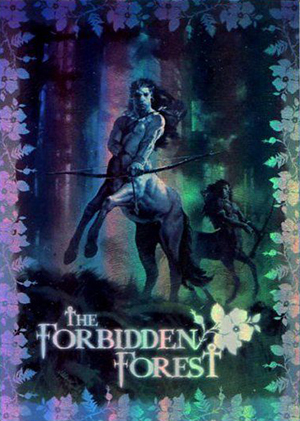 Each box also comes with one of four Forbidden Forest box toppers. 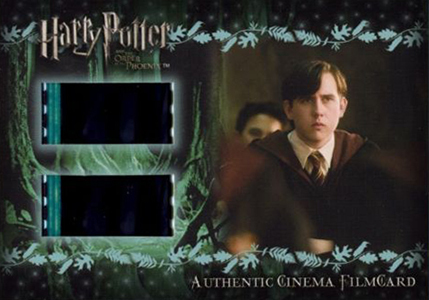 Case Toppers are a pair of lenticular cards. 90 cards. Hobby version has foil accents on the front, retail cards have no foil. Shop for base sets on eBay. 49 That ìoul, Evil Old Gargoyle! 73 We Won't Be Seeing You! 13 cards. Inserted 1:48 packs.All are redemptions except for Maudsley, Harris and McManus. 9 cards. Inserted 1:80 packs. #/294. 18 cards. Inserted 1:24 packs. 12 cards. Inserted 1:80 packs. Aren’t some of the Daily Prophet cards /#505? 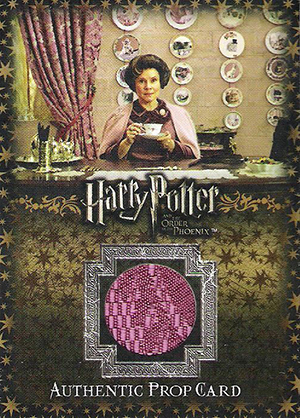 Brennan � I believe the card you are referring to is part of the 2007 Artbox Harry Potter and the Order of the Phoenix Collectors’ Update set. Harry Potter Goblet of Fire Update sealed Hobby card box(Autograph Prop Costume?